The material can be formed into three-dimensional shapes very easily and has become established in many industrial sectors. The radiator grille on the car, the smartphone casing or the emergency blanket of the first aid kit are just a few examples. Even the use in micro-technology components is becoming increasingly important. InfraTec works with a liquid crystal polymer (LCP). The base unit of the chip carrier is manufactured from this thermoplastic. This is followed by wet chemical activation of the entire surface as well as wet chemical metal deposition. For InfraTec as specialists in infrared technology, such a project can only be implemented with the support of partners. Hence, the research and development service provider Hahn-Schickard supported the project with its expertise in the fields of micro-injection moulding and metallization of plastics from the start. At Hahn-Schickard in Stuttgart, a chip carrier design suitable for injection moulding was drafted in coordination with InfraTec. 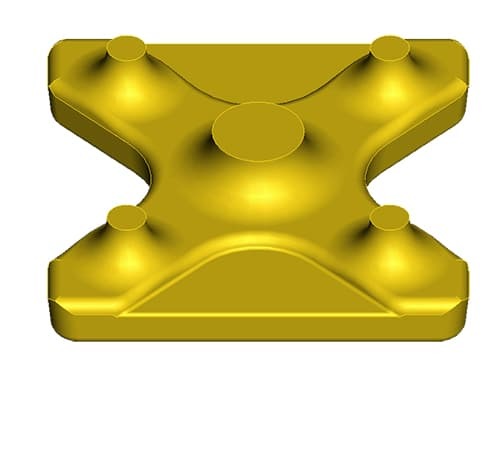 Based on this design, an injection mould insert was developed, which was used for the production of 400 sample chip carriers. The tests of these initial samples have already confirmed that the combination of plastic, micro-injection moulding and subsequent metallization appears to be suitable for the production of chip carriers: It is by no means a foregone conclusion. For instance, the size, shape and position of the carrier's support points only tolerate deviations of a few micrometres. This places the highest demands on the production. The test results provided the opportunity to optimise the chip holder shape once again and to allow a complete injection moulding tool to be developed. With this tool, 400 sample chip carriers were manufactured once again, which serve as a starting point for further research into metallised injection moulding parts as chip carriers for pyroelectric detectors. It is clear that the work will be continued. There are already positive answers to key issues. The chip carriers developed in the course of the project meet the functional requirements specified at InfraTec for current detector production. Standard technologies, such as low ohm contacting of the sensor chip by means of conductive adhesive or automatic die bonding, can be applied successfully on the new chip carriers. Stability and reliability of the detectors could be confirmed based on sample tests. Initial data on the electrical, thermal and mechanical properties of the injection moulding parts as well as the tolerances within the production are available, which mark an important step for better assessing the opportunities for later application. Further tests will be carried out in connection with the project. It remains to be seen how reliable the production quality will prove to be in the long term or which parameters may possibly be modified in relation to the chip carriers in order to ensure that the detectors can be adapted to specific measuring tasks later. Nevertheless, the outlook at the present time is a positive one. Chip carrier made of injection moulded, metallised plastic, possibly may enable to manufacture detectors in better quality with less or the same effort in the foreseeable future.